If you’re just starting your first ecommerce business and you’re looking for the perfect product to sell online, making products yourself can be a great way to start. The good news is that there are plenty of options. In this post, we’ll discuss over 30 of the best products you can make yourself and sell from home. Since you’ve most likely seen a lot of these products sold by businesses already, when reading through this list think about the ways you can build a brand around these products that caters to a different niche, or solves a not already addressed pain point. Alternatively, find a way to make these products better or put your own personal touch on them. Regardless of how you chose to build a brand around these products, making products yourself is an accessible and comparatively low-cost way to build a business, rather than if you were to have products made by a manufacturer. It’s also a great way to “own” your brand, as opposed to wholesaling or dropshipping where you’d rely on the expertise of other businesses to sustain your product line. If you’re interested in starting a bootstrapped business from scratch, or you just want to build a brand that’s completely your own, check out these 30+ products you can make yourself and sell from home. Creating bath and body products from home is commonly done, especially with the rising interest in “organic,” “natural,” and “synthetic chemical-free” products, so there’s definitely a consumer market for businesses that make and sell homemade bath and body products, but it’s worth noting that you’ll have to do your research regarding the rules and regulations that may restrict or prevent the kind of products you can ship to customers. If you’re just looking to sell your products locally you may not run into the same regulations (although, you still need to do your own due diligence), but if you want to scale and grow your brand beyond your local customer ecosystem and ship your products to customers elsewhere in the world, you’ll need to research how you can do that. Check out the US Food & Drug Administration frequently asked questions page for information on small businesses and homemade cosmetics. Being a super popular bath product, there’s plenty of online information available to help you make bath bombs from home. They’re relatively easy to make, comprised of simple ingredients and can be tailored to suit different scent preferences and skin concerns, so there’s plenty of marketing potential for this product. You can switch up the ingredients to make them suitable for soothing for skin rashes, eczema, or sunburns and you adjust their scent by using different essential oils such as lavender for calming or ginger for energizing. 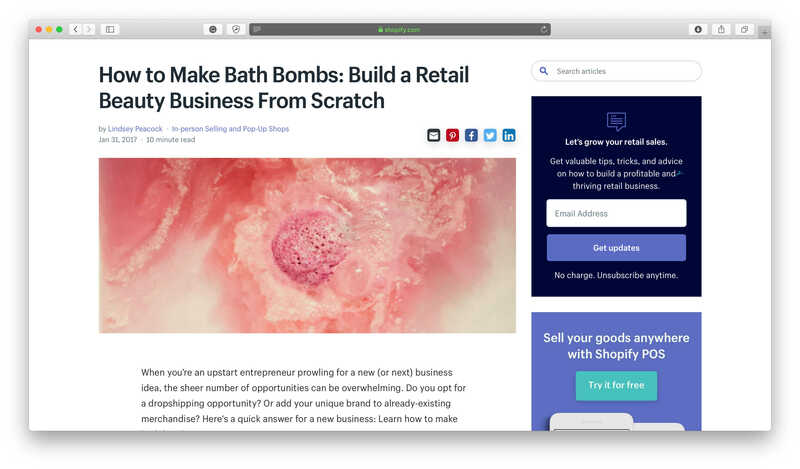 There’s plenty of different ways to make bath bombs work for your own brand, so research different methods to make them through resources such as Shopify’s post dedicated to making bath bombs or YouTube videos. The interest in solid cologne and perfume has been rising due to its practicality, portability, and longevity. It’s easy to apply, lasts long, is easy to throw into a purse or gym bag and lingers on the skin in some cases longer than a liquid cologne/perfume, depending on the quality of ingredients. If you’re interested in starting a business that sells fragrances, starting with solid colognes and perfumes may be a good place to start. 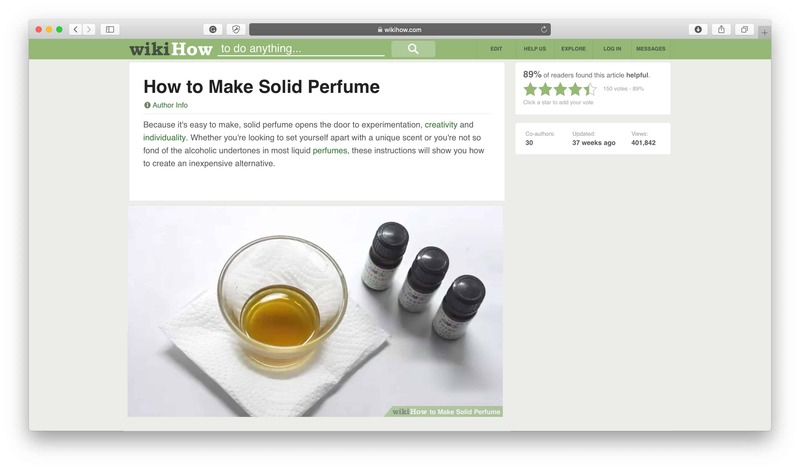 There’s plenty of online resources to help you make these solid scent bars, such as this Wikihow page dedicated to making solid perfume, so make use of these resources and start developing signature scents and recipes for your brand. Beard oil has been a huge trending product recently and consumer’s rising interest isn’t expected to fall anytime soon. With 21st-century men proudly growing and maintaining their facial hair, many workplaces embracing bearded appearances and a rising interest in male grooming products, this trifecta has created a perfect ecosystem for beard oils to flourish. 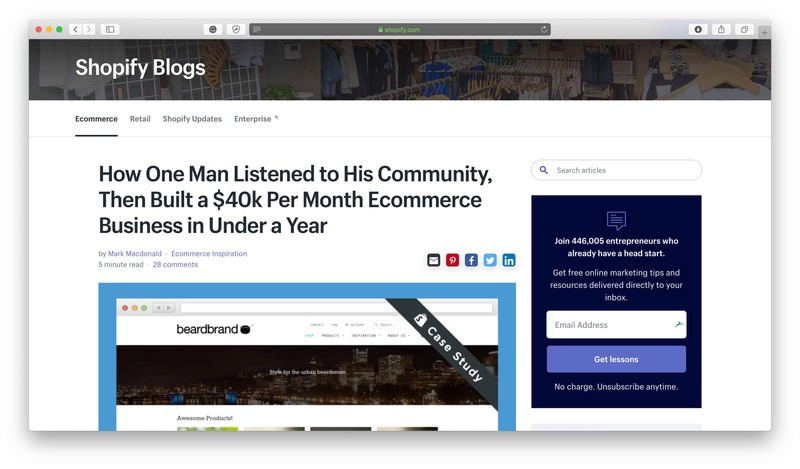 If you’re interested in riding this wave, check out online resources to help you develop beard oil recipes and even read up on businesses that have branded themselves on beard oil alone, such as Beardbrand, who were recently featured as a case study on Shopify. Another popular product, body lotion is an item that has withstood the test of time. Around for decades, if not centuries, its practical uses and soothing properties are attractive to men and women alike. Since it can also serve as an ointment for topical skin ailments and its scent can possess aromatherapy properties, there are endless ways to create a body lotion that stands out from the crowd. Focus on texture (whipped, gel, milky, light, etc. ), properties (soothing, moisturizing, fast-absorbing, etc.) and ingredients (aloe, coconut, jojoba, shea butter, etc.) and scent (fruity, nutty, floral, unscented, etc.) to create the perfect concoction to please you and your customers. 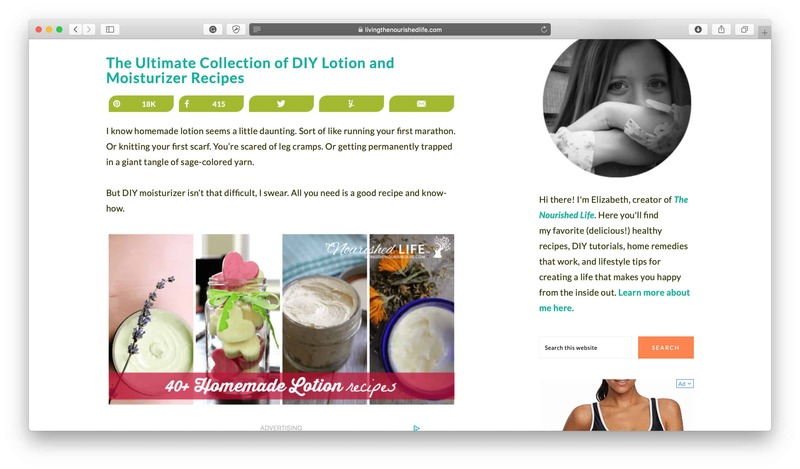 There are plenty of resources online to teach you how to make body lotions as well as homemade lotion recipes. Perhaps not the easiest of bath and body products to make yourself as the recipe must allow the soap to hold together under water while still having to work up a lather, but it’s by no means impossible. Like most homemade bath and body products, the ingredients to make soap are easily accessible and there are plenty of ways to customize soap to make it the perfect blend of texture, ingredient properties and scents to appeal to you and your customers. 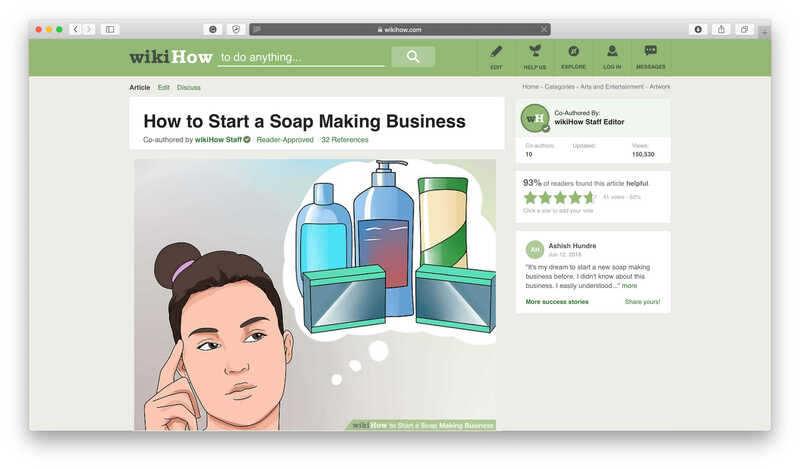 If you’re interested in starting your own soap businesses from home, check out this Wikihow article to learn how to make your own soap. As an incredibly versatile product that can be used for the face, lips, body, and feet, exfoliating scrubs are a popular bath and body product used to buff away dead skin cells, stimulate blood flow, reduce the appearance of cellulite and make skin feel soft and smooth. There are plenty of ways to make these scrubs such as with salt, sugar, oats and baking soda, and the properties of the scrubs and the scents can be customized to fit the needs of the customer. 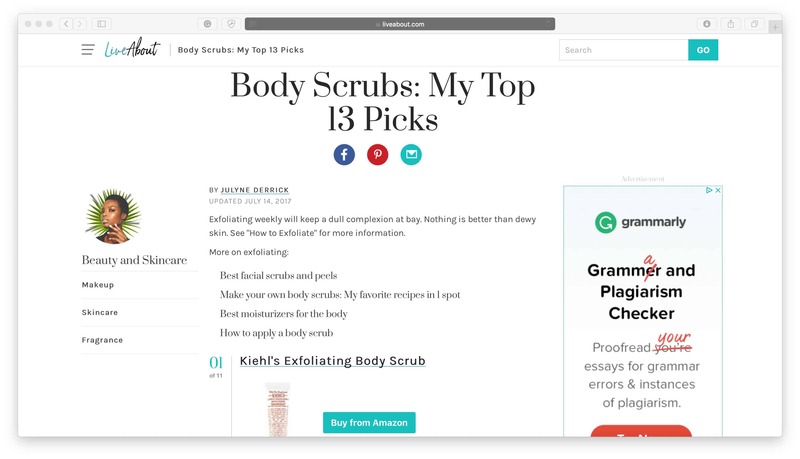 Again, there are plenty of online resources for this bath and body product but this article rounds up the specific properties of exfoliating scrubs that are currently on the market to help you get a glimpse into what customers are looking for in a scrub and this article shares different recipes for exfoliating scrubs. There’s virtually an endless amount of hair products you can make from home and start a business with whether it’s shampoos, conditioners, hair masks, hair perfumes, oils, etc, so get creative and start building a repertoire of recipes customers will love. It’s the properties of the product that’s going to mean the most for the customer whether it’s coconut oil for moisturization, argan oil for shine, lemon for lightening, castor oil to promote growth, or tea tree for antiseptic properties, for example, so do your research and develop products that solve pain points for your customers. 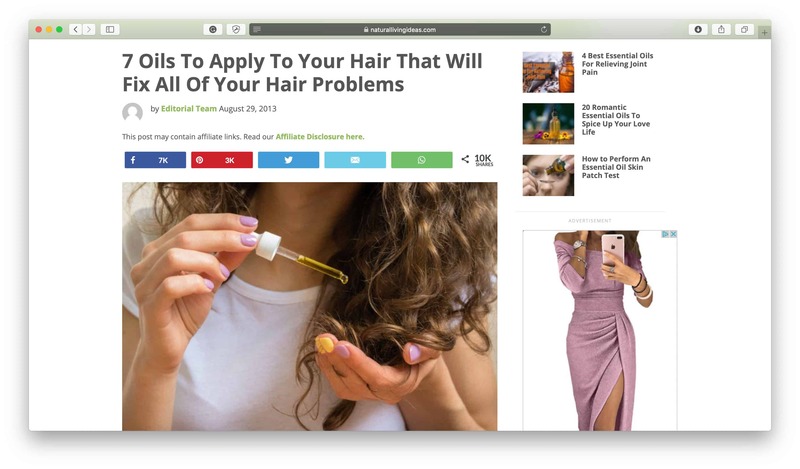 There are plenty of resources online such as this article that discusses the benefits of coconut oil for hair or this one that lists various oils and their uses for hair, so take your time researching ingredient properties as well as hair product recipes. There are plenty of different types of accessory businesses you can start from home as many are easy and low cost to start up and even require minimal skill. Some of these accessories are great to pair together when making a business, such as bow ties and pocket squares, as they often appeal to the same audience, complement one another and are produced using the same materials. A popular fashion accessory for both men and women, belts continue to serve a practical purpose as well as a stylish one. Whether they’re used by the wearer to hold up a pair of trousers or to cinch in the waist of a dress, there’s plenty of different styles for businesses create and sell. Making them isn’t as hard as it may seem, and it’s definitely something you can do from home with accessible materials. Use online resources such as this one from Reddit: How to Make a $100 Belt on the Cheap, practice the techniques, develop your own style, use high-quality materials and start building your own belt business from home. 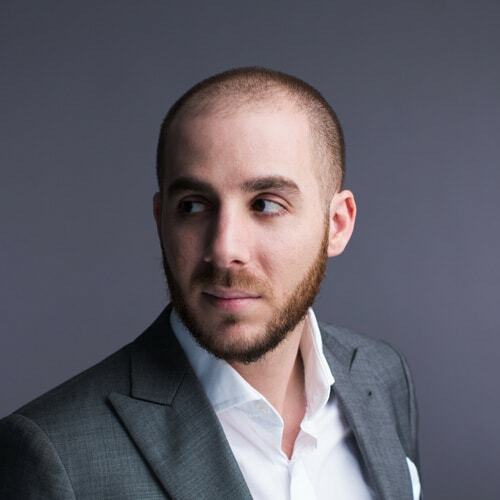 Bow ties have increasingly become a trending product and as Shopify documented in their What to Sell Online: 10 Interesting Product Ideas Trending Right Now article, online searches for men’s bow ties have almost tripled in the past three years. The good news is, it’s possible to make them from home and there’s lots of room for individuality and style. Find a pattern online or from a craft/fabric store, source some unique fabrics, and use a sewing machine to put it all together. 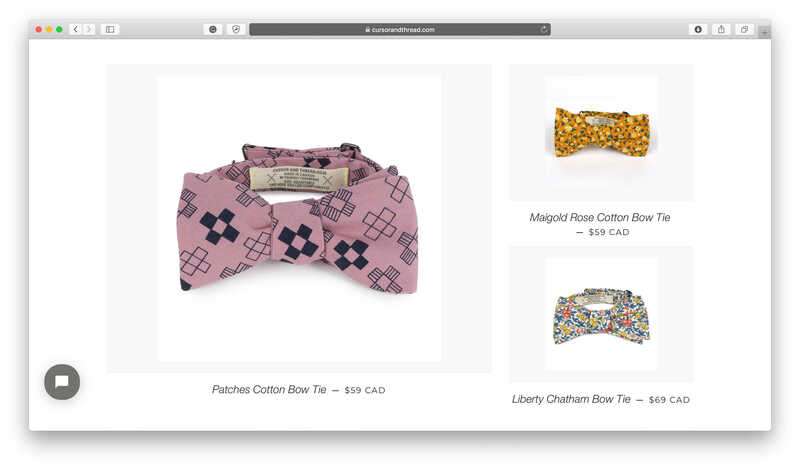 Take a look at businesses like Cursor & Thread and Fitzy that specialize in accessories like bow ties to see what’s on the market and how consumers are responding to it. Another trending clothing accessory, pocket squares have risen in popularity due to men embracing more metrosexual attitudes towards style and fashion and women embracing more androgynous clothing pieces. The pocket square exudes a dapper appearance for the wearer and since it makes up a small part of an outfit, wearers are more likely to chose pocket squares that are made of unique and fun fabrics, patterns and textures. From a business standpoint, pocket squares are an excellent choice because they’re small, easy to ship and easy to make. 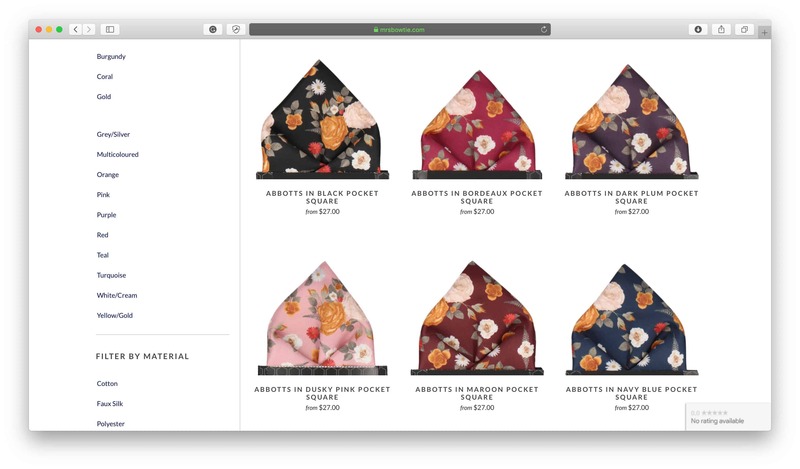 Have a look online or at craft/fabric stores for a pocket square pattern, and look at stores online that specialize in accessories like pocket squares such as Mrs Bow Tie to get an idea of what styles consumers are interested in. There are plenty of options when it comes to making scarves whether you choose to knit, crochet or make them from fabric and there are plenty of styles you can create such as blanket scarves, neckties and infinity scarves that can be made to withstand any type of weather. To start your own scarf business from home choose a method (knitted, crochet or fabric), a style (blanket scarf, necktie or infinity scarf), find the materials you need from a local craft or fabric store and develop your skills and techniques. There are plenty of different ways to customize scarves to make them look unique and stylish, whether you use embellishments such as beads or luxurious fabrics like silk, so experiment and find a style that you can build a brand around. 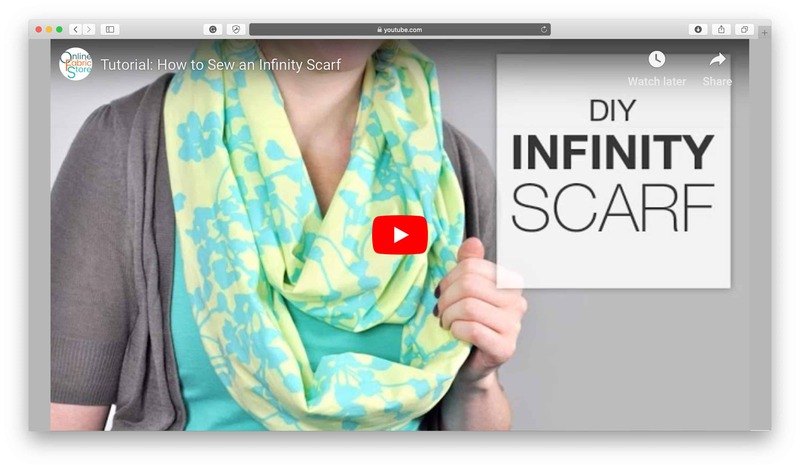 Find online resources such as patterns or videos such as this one on How to Sew an Infinity Scarf to help you create your product. With so many different ways to create a headband, there are plenty of choices for you to build a business around them. They can be made from fabric, elastic, woven threads, yarn or hard plastic. In fact, they can also be used as a foundation to create other headpieces such as fascinators which are typically worn by women for formal events. Think of how you can use embellishments to make your headbands unique, such as by adding appliques like bows, flowers, lace, and beads to make a unique product. Also, think of which niche market your headbands will serve; will they be for babies, children, women, athletes, or headpieces for formal events? 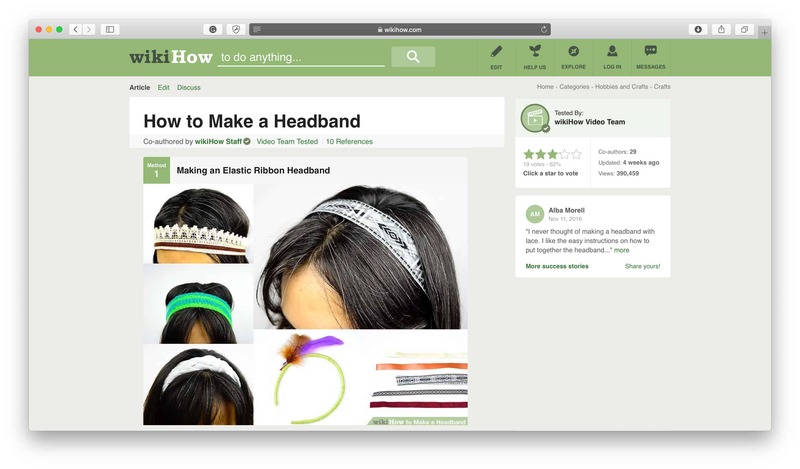 For more information on how to actually make headbands, check out this Wikihow on 4 Ways to Make a Headband. These are another great product to stock as an online business since they’re small to ship, easy to make and there’s lots of room for creativity. 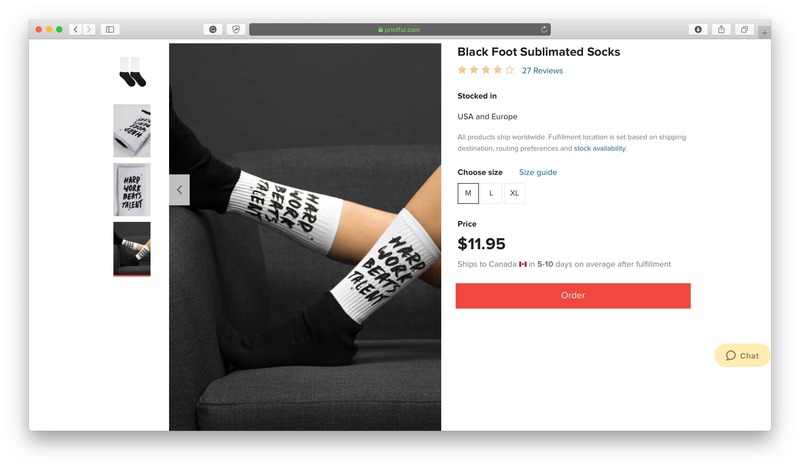 Even if you don’t possess the capability to make the socks yourself, you can print designs on and dropship socks through Printful’s sock dropshipping service, which is a less hands-on approach to actually making the products, but it allows you to focus on other aspects of building your business such as customer service, web design, product selection and more. Enamel pins have erupted into the fashion space lately as a means to express individuality whilst appearing kitschy and often in a collection on jackets and bags. They’re a fun and unique way to express political or societal beliefs and opinions and are often made to look like animations or cartoons and sometimes include quotes or sayings. 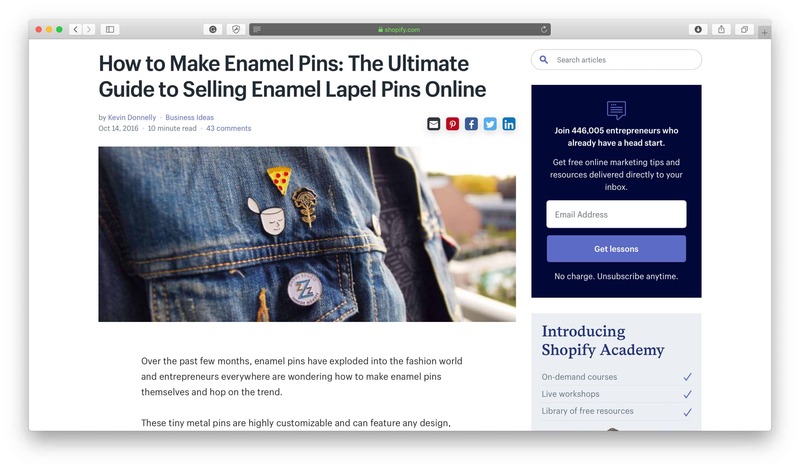 If you’re interested in making your own enamel pins and creating a business of it, check out Shopify’s Guide on How to Make Enamel Pins. Due to the rising awareness of the harm plastic bags play on the environment, reusable carriers such as tote bags have become a practical alternative. Since they’re lightweight they’re easy to add to a purse or backpack, or they can just be carried around for whenever they’re needed to hold groceries, books, supplies or food. As they’re often made of a thin canvas material, they’re commonly printed with quirky cartoons or sayings which different institutions, clubs, and businesses have now been making use of to promote their own brands or manifestos. If you’re interested in creating a product that caters to the environmentally conscious niche or you have other ideas for how tote bags can be used, try making them yourself. 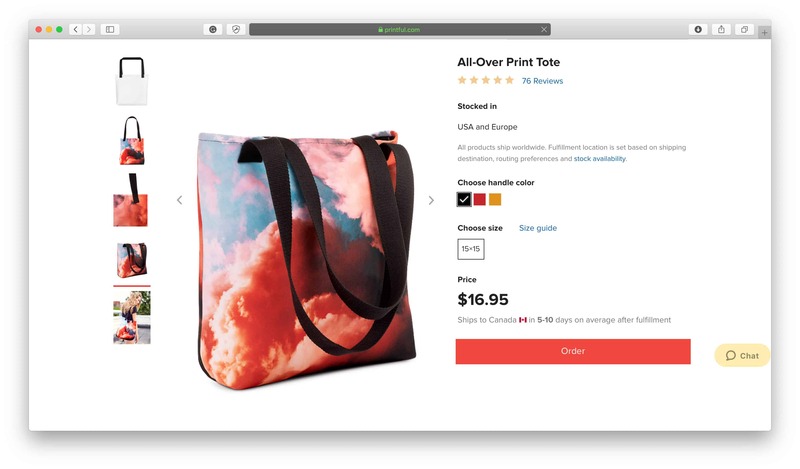 Alternatively, if you want to focus less on the creation aspect and more on the design process, check out Printful’s tote bag dropshipping service to get tote bags made and shipped out to your customers for you. Hats are obviously a very popular and practical accessory and while they may not be the easiest product to make from home, there are services you can use to make that process more accessible. 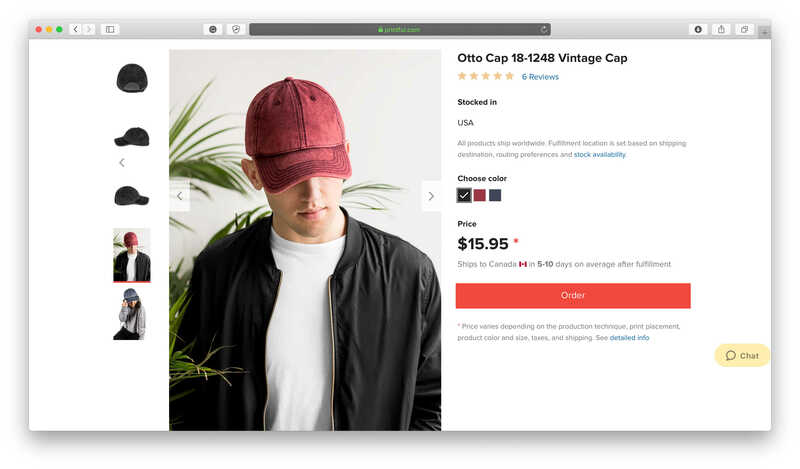 If you’re interested in making hats, whether they’re snapbacks, 5-panels, dad hats, mesh backs, beanies or bucket hats, you can utilize Printful’s hat dropshipping services to help you make these products for your business. You’ll be able to create custom embroidery for your hats so they’ll be unique and true to your brand, and instead of focusing on how to actually construct the hats themselves, which can be a time consuming and laborious project, you can direct your focus to other aspects of building and growing your business such as new designs, a larger product selection, different hat styles, customer service and more. Perhaps not the easiest of products to make, but one that can turn out beautifully with time and effort, creating handbags from home is a potential business idea for those committed and passionate about the finished product. 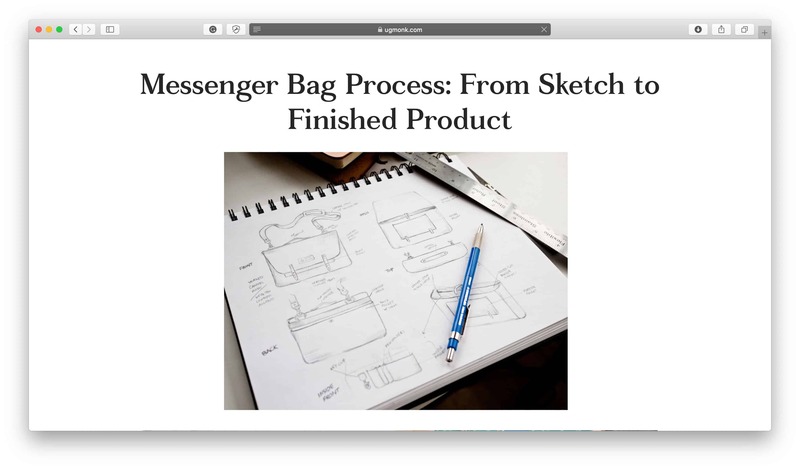 To learn more about how to create a handbag from scratch, check out this resource: Messenger Bag Process: From Sketch to Finished Product. In terms of creating an ecommerce business around your own homemade handbags, think about how you’ll stand out within an oversaturated market. Plenty of retailers sell handbags to consumers at both premium and low-end prices, so think of how you can market your homemade handbags to compete for some of the sales. Phone cases are a really attractive option for businesses to create from home as they’re relatively low cost to produce, it’s easy to hold inventory, there are many different styles of cases, an endless amount of options when it comes to case artwork and they’re small and easy to ship. This Shopify article dives deep into the intricacies of How to Make Custom Phone Cases to Sell Online by discussing the types of phone cases, how to choose which devices to focus on, where to get phone case artwork from and how to get your cases made. 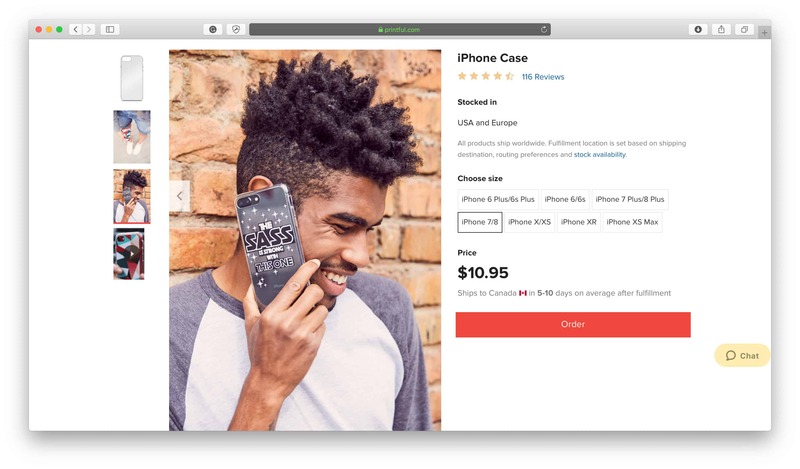 If you’re interested in starting a phone case dropshipping business Printful offers a phone case dropshipping service that’s an easy and convenient way to get started. Jewelry is a massively diverse category when it comes to products as there are so many different types, styles, materials, and niches to cater to. The good news is that many jewelry businesses were started by the founder making the jewelry from home, so it’s an accessible businesses model that can be scaled to fit whichever stage you’re at. If you already have some jewelry making skills then you’re on the right track, otherwise, you may want to start learning and refining some jewelry making techniques. We recommend starting off with one product whether it’s earrings, necklaces, bracelets or rings and doing it well instead of trying to do it all right off the bat. Start thinking about how you can produce high-quality pieces that can be sold to customers, what type of niche you’re going to cater to and how you’ll source enough materials to make your products consistently enough to meet demand. 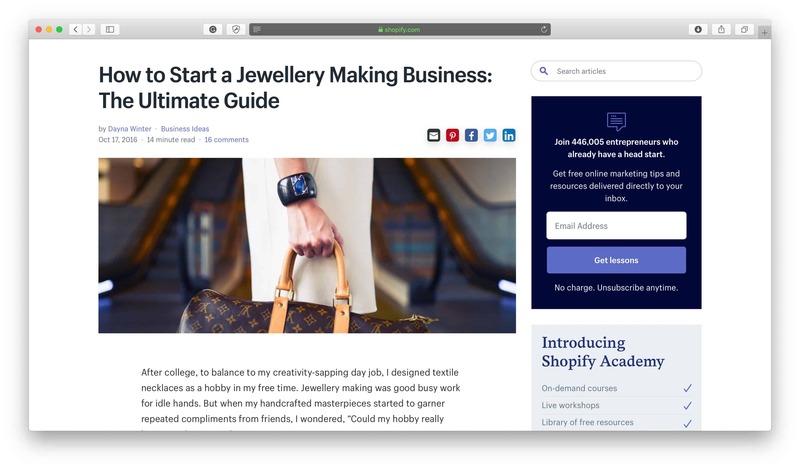 For more information on How to Start a Jewellery Making Business and Shopify Burst’s How to Sell Bracelets Online, check out these resources. A great product you can make from home with very accessible materials are greeting cards. Most craft stores have plenty of supplies for card makers including paper, stamps, embellishments, specialty scissors, stickers, ribbon, glue, glitter, etc. which can be used to create beautiful, bespoke and professional looking cards. Depending on the types of cards you want to make and how maximal their aesthetic, the initial investment into supplies may be costly, but once you have a foundation of materials to work with you can usually make at least several cards from one piece of supplies. Before you purchase the whole craft store though, we recommend starting small and trying out different card making techniques and styles before you fully commit to it as a business venture. Card making can be laborious and tedious so make sure it’s something you really love if you haven’t tried it already. 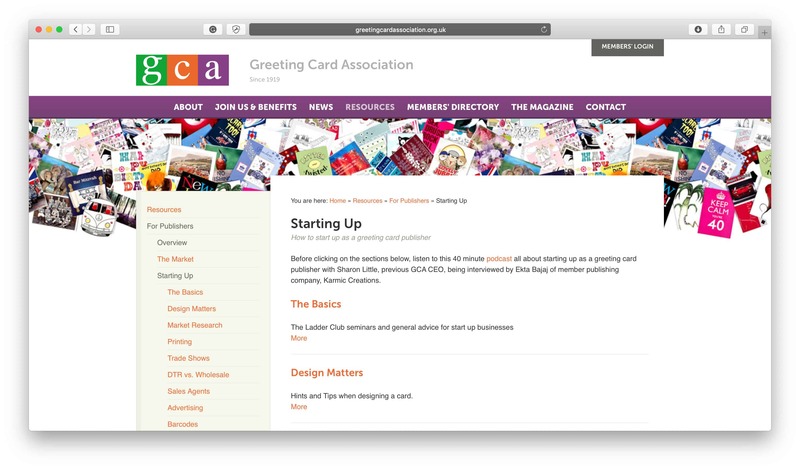 If you’re ready to start building your own greeting card business and already have the skills and techniques to create cards that customers will buy, check out The Greeting Card Association Starting Up Guide to help you build your business. 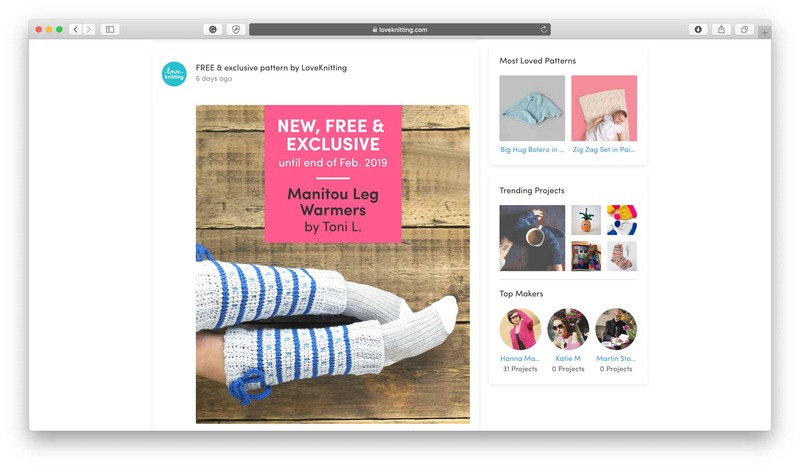 Whether you can knit clothing, blankets, toys for children, homewares, etc, knitting is an accessible skill to learn with plenty of online resources available to help you learn, such as Love Knitting. Think about the kind of products you can knit or the types of materials you can use to make unique products that serve a niche or solve a pain point for customers. Similar to knitting, but a completely different technique, crocheting can also yield an array of products such as clothing, blankets, toys, homewares and more. 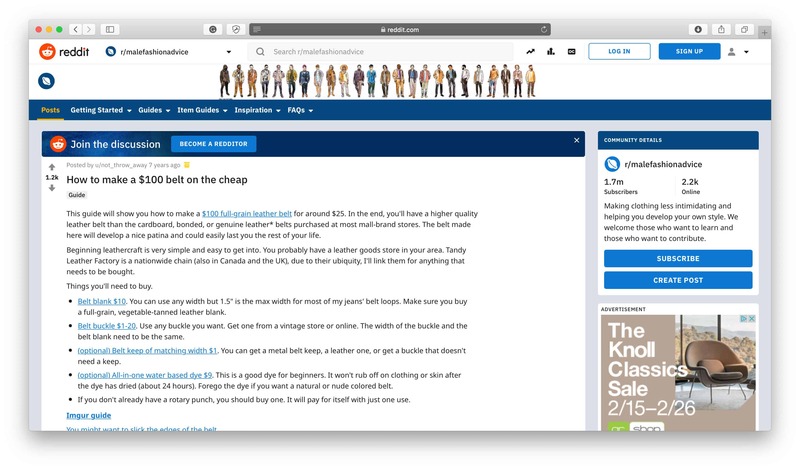 There are also plenty of resources available online to help teach the craft, such as Love Crochet or simply conducting a Google search will bring up plenty of results. The appearance of knitted products and crocheted products can be very different, so educate yourself on their difference before you pursue one or the other to make your own products. If you have the skills and abilities to create artwork or designs either by hand, photographs or electronically, a great way to create an ecommerce business is to print your work onto homewares. Whether you actually print your work on a canvas or have it printed onto household items such as pillows, mugs or blankets, you can tailor your products to appeal to your niche market whatever their interests are. This is a great business to start from home if you are a skilled artist or photographer and want to sell your work to the public. 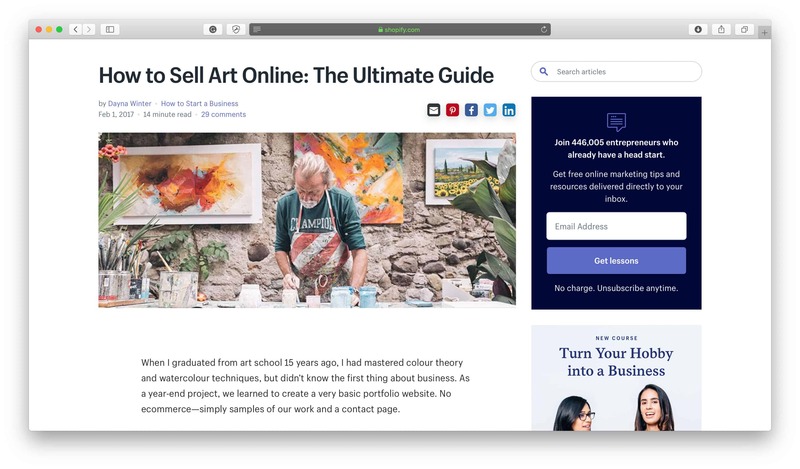 If you’re interested in selling your art online, Shopify has a comprehensive guide on the details and realities of the business, but if you’re interested in outsourcing the printing process, Printful offers a variety of services to have your work printed on paper, posters, and canvas which then can then dropshipped to your customers. As a trending home decor item, terrariums have burst onto the homeware scene thanks to their low-maintenance but beautifully aesthetic properties. Usually represented as mini-ecosystems contained in small glass jars, bowls or containers, they’re easy to make and attractive to customers. If you have an interest in plants or an interest in learning how to put together terrariums (it’s relatively simple!) then this could be the business for you. They’re portable so they’re a good item to sell but think about the shipping and handling requirements of the glass jars and any regulations that may inhibit shipping plants around your country or abroad. 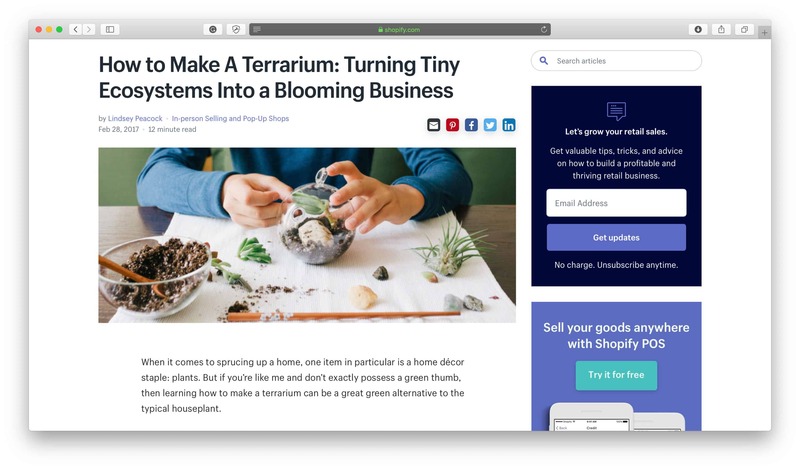 Shopify’s guide on How to Make a Terrarium can help you answer some of these questions. This is an attractive product both for consumers as well as businesses for many reasons: consumers are interested in the aromatherapy and atmospheric qualities of candles as well as various materials used to make them that have come into trend recently such as soy wax and wood wicks. Businesses are interested in candles as a product because they’re easy and low cost to make, customizable, and the ingredients and materials are fairly easy to source. 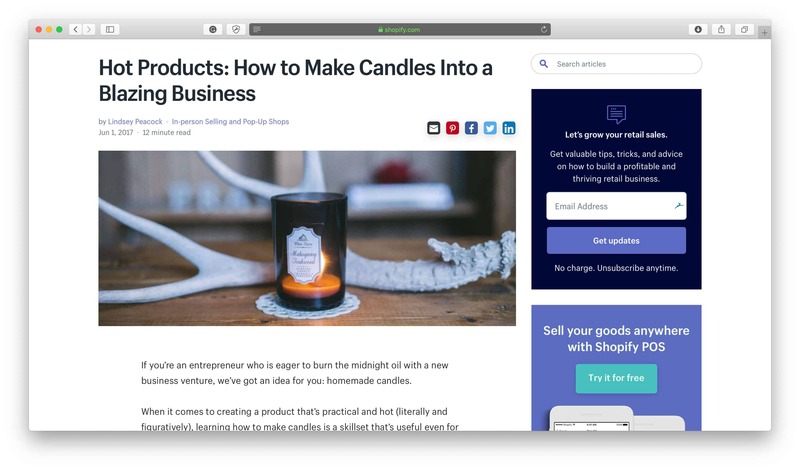 Shopify has created a guide on How to Make a Candle Business if you’re interested in pursuing it further, but make sure you think about how your candles will appeal to your niche market, what ingredients and scents you may want to create and the shipping rules and regulations you’ll need to adhere to. Mugs are easy to customize and appealing to many different niche markets depending on their design. Even a simple mug can be special with a funny quote, heartwarming message or quirky artwork, so if you’re skilled in any one of these areas consider turning your work into mug designs. 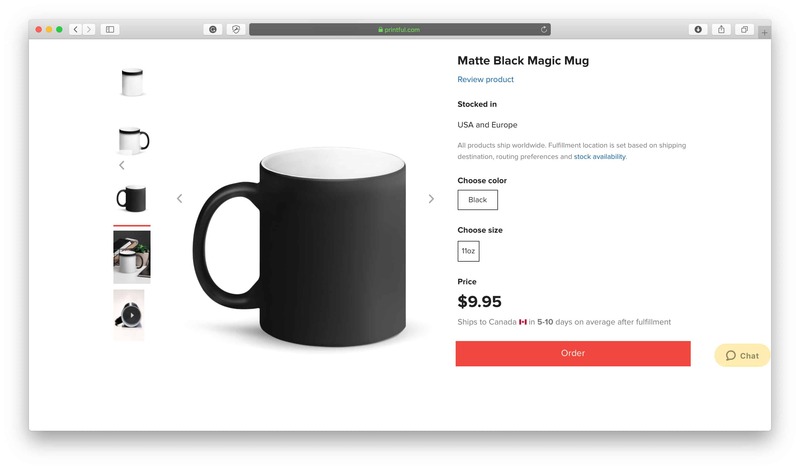 You don’t even have to have the machines or materials to print on mugs if you use Printful’s mug dropshipping service, which can be a convenient way for you to focus on your designs rather than the printing and shipping aspect of your business. A useful homeware, throw pillows are meant to be decorative and inject a pop of color or artwork into a space. This means that they’re the perfect product to have custom artwork or designs printed on them as customers will likely appreciate their unique appearance which they can showcase in their living rooms or bedrooms. 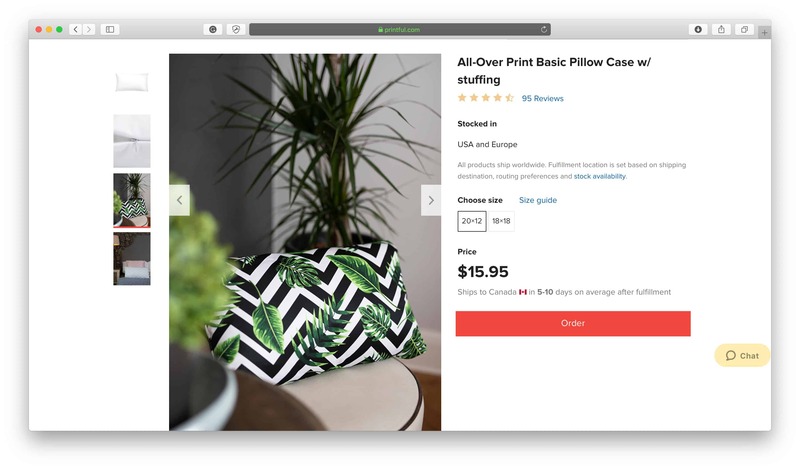 Printful provides a custom throw pillow dropshipping service, which is ideal if you have designs to print on a pillow but aren’t necessarily interested in purchasing printing materials or learning the printing process. Depending on where you’re located, beach blankets can be an attractive seasonal product or an all-year product you can print your artwork or designs onto for your customer. 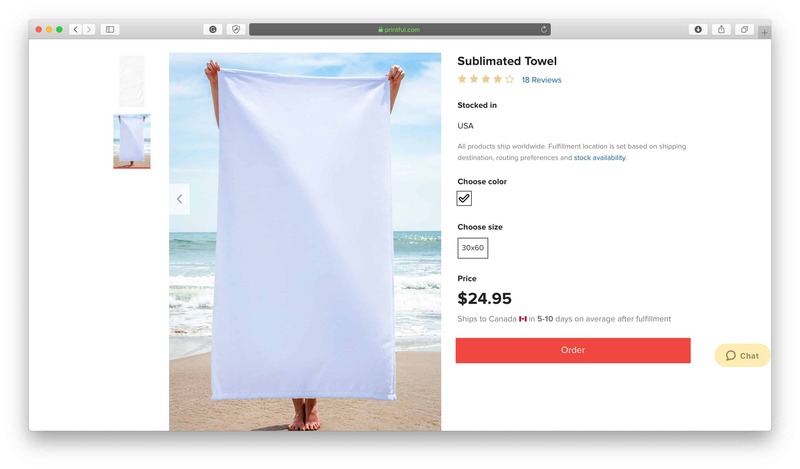 Using Printful’s beach blanket printing and dropshipping service they’re easy and low cost to make and can be a fun product with colorful and bold designs for both you and your customers to enjoy. If you’re interested in starting a beach blanket business from home, think about when your customers will be using beach blankets (will it be all year, just in the summer, at their summer houses or on holiday?) what kind of designs they’d like to see on them (would they prefer bold and bright colours or muted and neutral colours?) and what kind of designs you can print on the blankets to enhance their beach experience. Selling apparel is a great first business as there are very few shipping rules and regulations, it’s a very accessible product, easy to store inventory and small to ship. The main drawback with selling apparel, however, is that it’s a very oversaturated market so you’ll have to really hone in on a niche market to cater to be able to compete within the market, even as a small retailer. Be aware of rising trends in style, fit and design and see how you can incorporate it into your business. To start a legging business from home, think about how you can stand out within an oversaturated market. There are plenty of athletic-wear companies that specialize in leggings for both sports and homewear, so you’ll need to target a niche market or solve a pain point for customers to purchase from your brand. 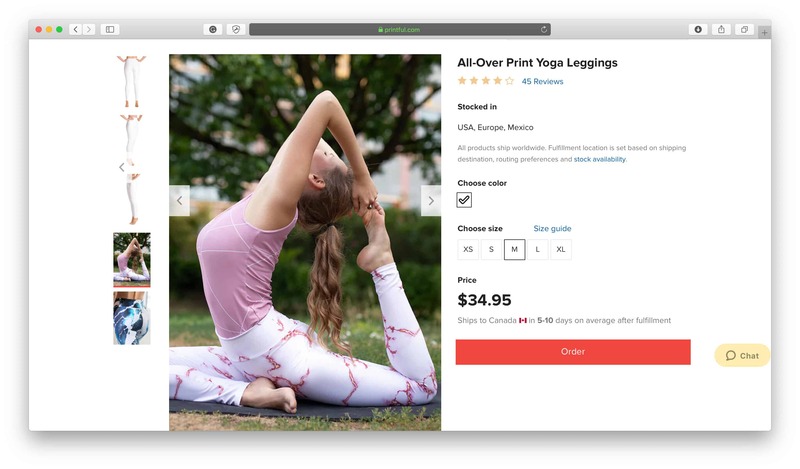 If you’re interested in having your leggings printed for you, Printful’s legging dropshipping service is worth looking into as it’s one of the easiest and low-cost ways to start your own legging business from home. One of the most well-known ways to start a business easily and inexpensively from home, t-shirts are a great way to get your foot in the door to owning and operating your own business. 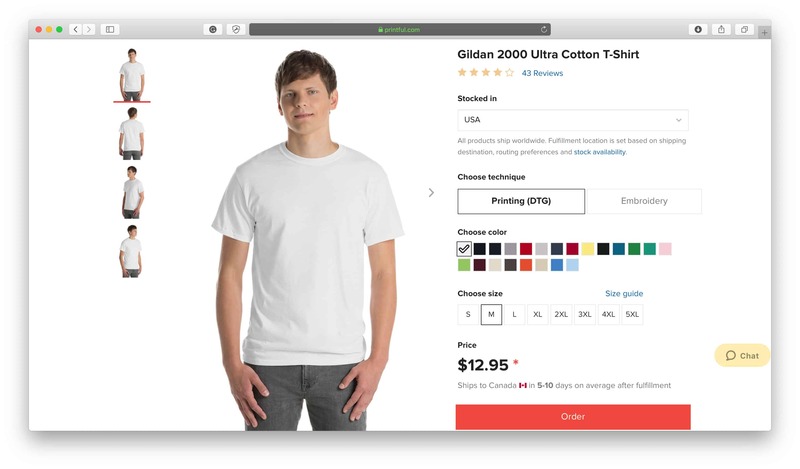 They’re a low maintenance product to create, sell and stock which makes them attractive for businesses, customers love them because they’re practical and with the rising interest in at-home t-shirt businesses there are plenty of services you can use to help create your t-shirt business right from home. Printful is our first recommendation to create custom printed t-shirts as their product selection is great and their service is easy to use, but there are plenty more out there. By using a dropshipping service you save yourself a lot of time and money sourcing materials and laboriously printing the shirts, so it’s well worth it to outsource it to a company like Printful so you can focus on your designs. Bonus: Read about our experience here on how we started our own t-shirt dropshipping business in 24 hours. 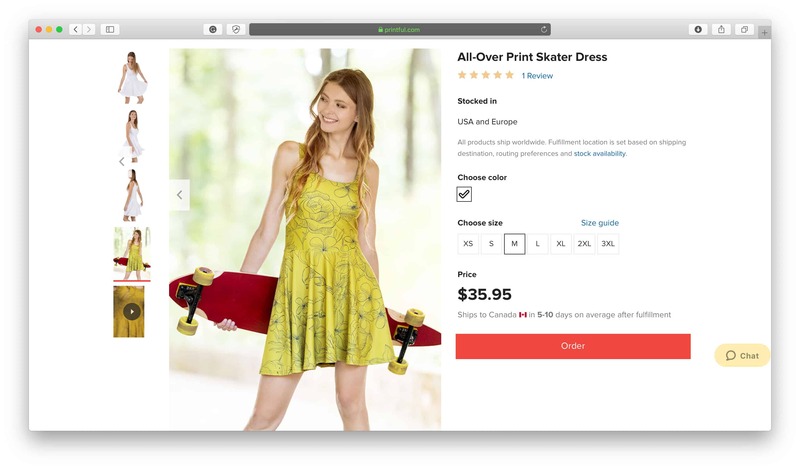 Starting your own dress and skirt business from home is very similar to starting a t-shirt business in that it’s relatively easy, low cost, and there are many different services that are able to print and fulfill them for you, just like Printful’s dress dropshipping service and their skirt dropshipping service. When starting this business from home, again, think about what kind of designs will appeal to your niche market, how you will stand out within an oversaturated market dominated by large retailers and how will you market your products to make your brand appealing to potential customers. 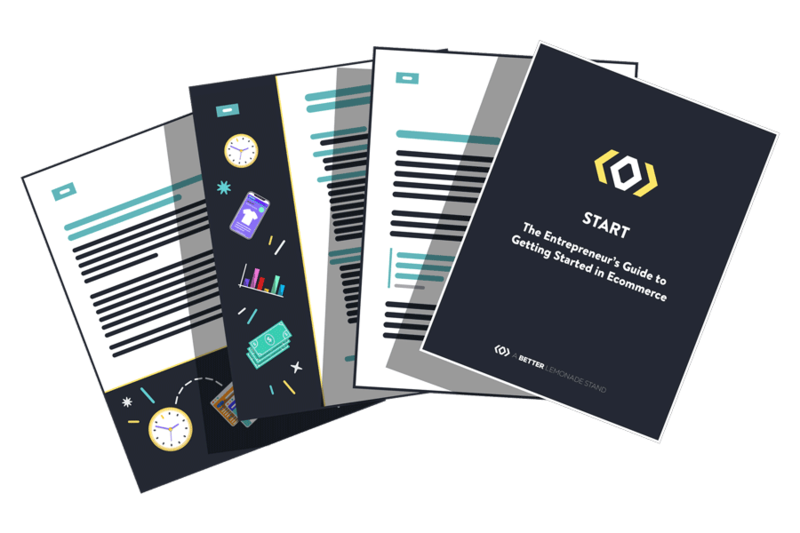 Bonus: For further discussion on some of the products mentioned in this post and more, check out our previous articles: Step-by-Step: Home to Start 11 Different Types of Ecommerce Businesses and 75 Print-on-Demand Product Ideas. 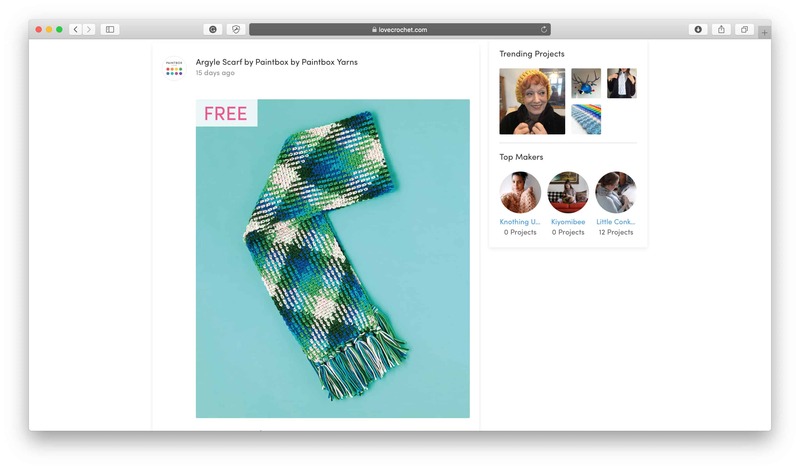 Etsy Manufacturing: Find production partners for your creative business in categories such as apparel & textiles, machining & fabrication, jewelry & metalsmithing, and printing. Love Crafts: An online community for makers to share projects and advice as well as purchase supplies. How to Design Packaging for a Handmade Business: Tips, advice, ideas, and inspiration for creating packaging for your products. The Design Process: A useful blog post outlining the process of taking a product to market, including advice and resources. Maker Mentors: An online community dedicated to connecting creators to the resources they need to build their own business. Includes webinars, workshops, newsletters, a blog and more. Ponoko: Bespoke laser cutting and engraving for creatives and businesses. Guide to Product Design & Development: This comprehensive guide outlines the entire process of designing and developing a physical product. The Product Startup: Product development for small business. The Product Startup Podcast: Listen to industry experts give their best advice and how other small business owners launched their products. 108 Resources & Tools to Turn Your Ideas into Products: The Product Startup’s guide to the resources and tools you can use to turn your ideas into products. 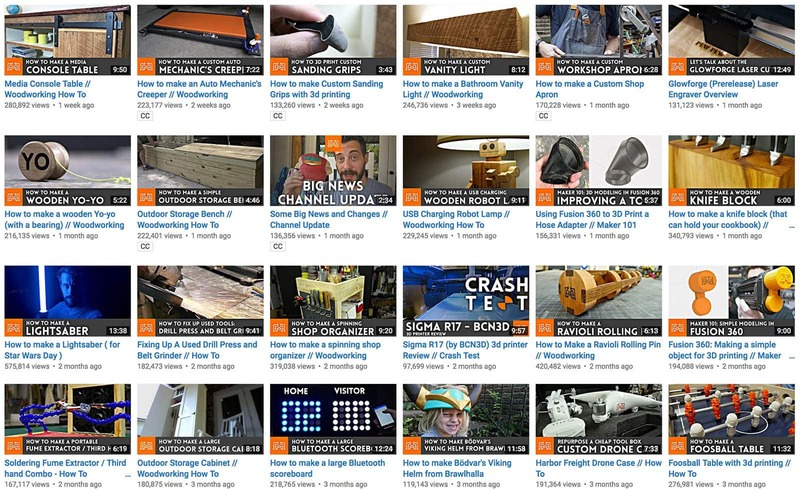 This channel is dedicated to inspiring and empowering people that may lack the skills to create items through woodworking, metalworking, 3D printing and more. It’s also a great source of inspiration to show you how to make items that you can create and sell for your at-home business. 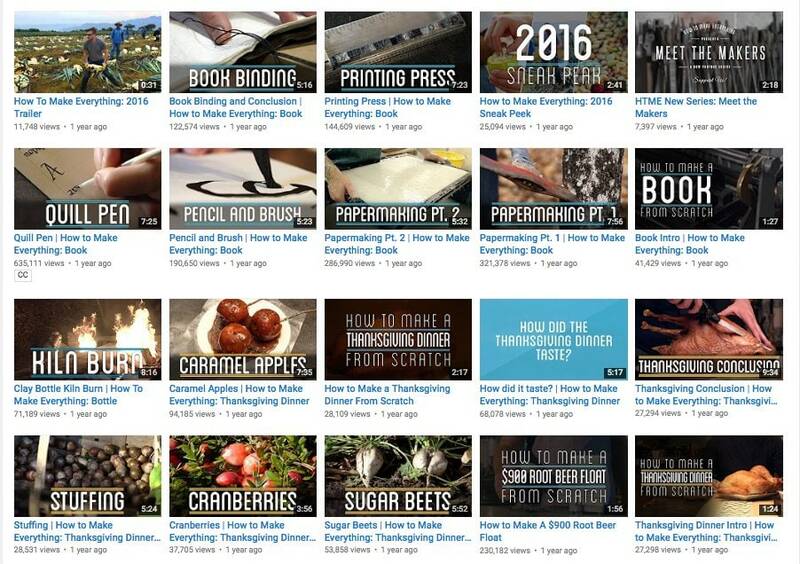 Take a look through the videos and think about what you could learn to make and then use the tutorials to develop skills and refine your technique. 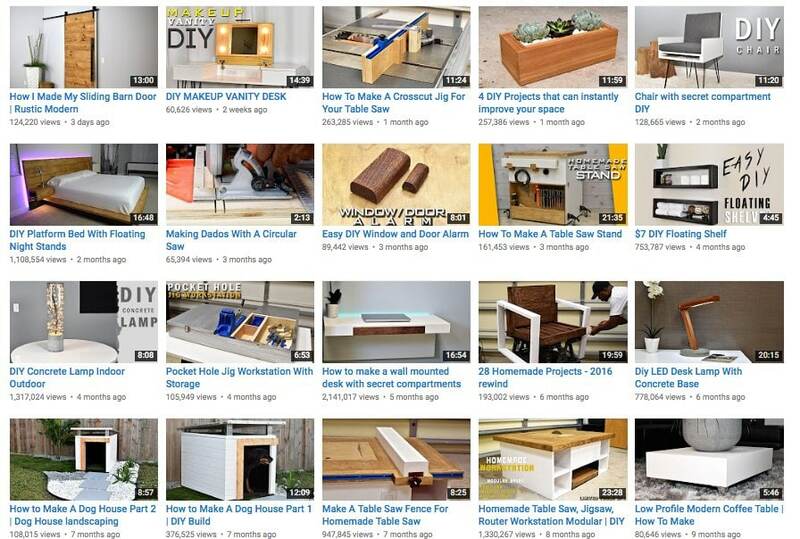 This channel focuses solely on woodworking and places an emphasis on design and originality to show that woodworking can be a creative skill. There are plenty of great tutorials ranging from beginner to advanced levels that you can follow along with and learn how to build a handmade product. This channel specializes in understanding manufacturing and production processes and then using that knowledge to create everything from scratch. The mission of this channel is to take the items that we use every day and take for granted, and then learn how to make them ourselves. 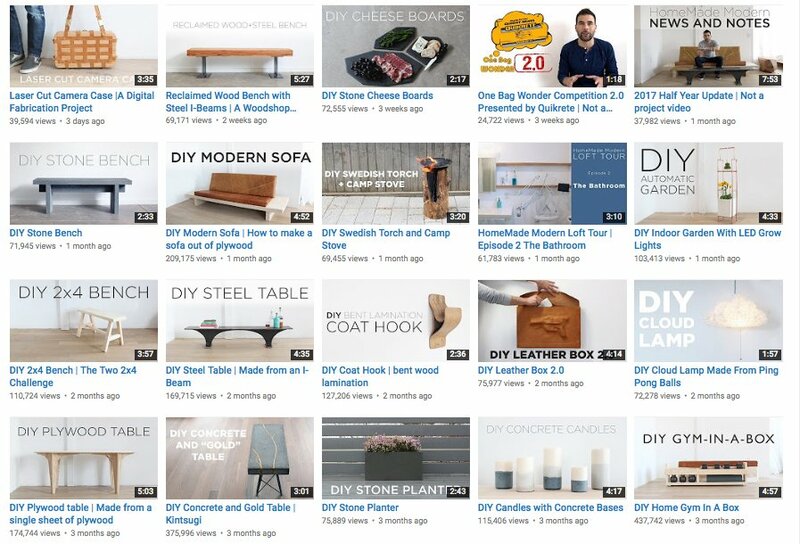 This channel is a source of design inspiration and knowledge, focusing mainly around items that can be used in and around the home. Although beautiful, some of their tutorials including stone tables or concrete benches may not be practical for an ecommerce business to create and sell, but they also have plenty of tutorials for smaller sized items that would be perfect to make, sell and ship to customers. 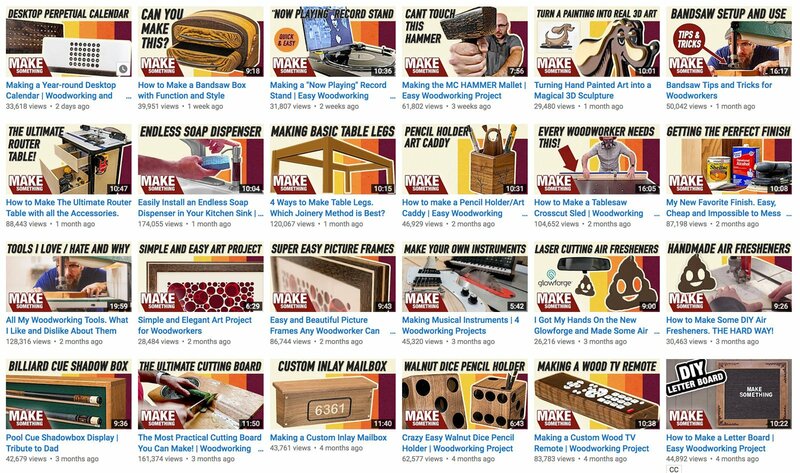 This channel focuses on making woodworking projects simplified and accessible while still being practical and beautiful, which is perfect if you’re a beginner woodworker. Some of the projects may be too large for an at-home ecommerce to make and ship to customers but there are many great smaller projects you can try out for yourself, some of our favorites we’ve listed below. This channel has an array of tutorials that would be great options to turn into products you can make for your at-home business. 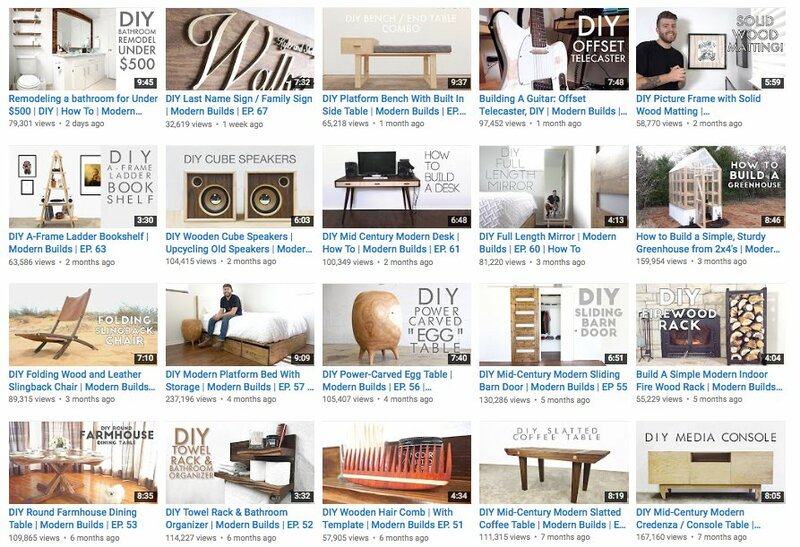 These tutorials are aimed at the beginner level so anyone with some time and creativity should be able to follow along and create some beautiful DIY projects out of wood or concrete. Suppose you don’t have the skills or abilities to hand make your products or you really don’t have the time to dedicate to making products yourself, but you still want to sell great products. Enter, Spocket. Spocket is a relatively new app that enables Shopify store owners to connect their stores with dropshipping suppliers all around the world. Since it’s a completely automated process, the Shopify store owner simply selects any products they want to sell from any supplier on the Spocket marketplace and once a customer places an order through the merchant’s store the supplier will then fulfill and ship the product to the customer. As the merchant, you make a commission for facilitating the sale between the customer and the supplier. 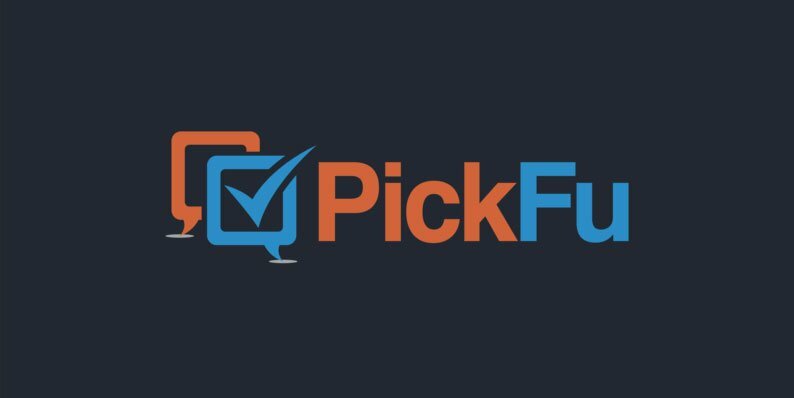 There’s a massive amount of products to choose from, and Spocket allows you to create a curated selection of these items that you neither have to make, fulfill, or ship yourself and yet you still get to sell high-quality and in-demand products. One of the main drawbacks to building a business from home with products you make yourself is the issue of scaling in the long term. While we advise against worrying about how you’re going to scale in the future before you’ve even started, it’s something to keep in the back of your mind. Maker’s Row: American made manufacturing sourcing and education. Sourcify: Connects you with a vetted selection of world-class manufacturers. Guide to Safely Sourcing Products from Alibaba: Learn how to utilize Alibaba safely to manufacture products for your business. How to Source Products from Chinese Manufacturers: An introduction to the different types of manufacturers that exist in China and how to communicate with them. It’s likely you won’t need to outsource your production immediately, so don’t rush into finding a manufacturer to help scale your business. Start making your products yourself, build your business from home and work out your own processes and systems before you outsource to anyone else. This will help you develop and solidify your brand, work out quality control expectations and be able to respond to customer feedback quickly. We hope this roundup of 30+ products you can make yourself and sell from home has given you inspiration into the types of businesses you have the ability to start from scratch and build with whatever materials, skills, and techniques you have available to you. Building a business can be accessible, low cost and high quality if you invest where it makes sense and stay bootstrapped where it’s necessary. There are so many useful resources online for creators, so do your research, be thorough and take time to learn and experiment. The more experience you have the better your products will be and online resources can help get you there. Don’t worry about scaling too much at the beginning, just focus on creating great products, building a solid brand and reaching out to your target customers. By creating your own products and building your business from home you have the ability to run your business how you choose to, whether that’s just as a side hustle or if you eventually want to make it your full-time job. It’s up to you, just get started first.